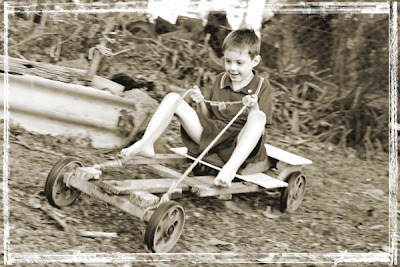 Have you seen a go-cart as old as this and still being run around the backyard?? It was made, I think, by a couple of my brother-in-laws and my father-in-law close to fifty years ago!! It’s been modified and repaired lots over the years and now my kids are getting old enough to be able to ride it. It’s SUPER fast and takes a bit of learning to steer, but it’s a LOT of fun! !